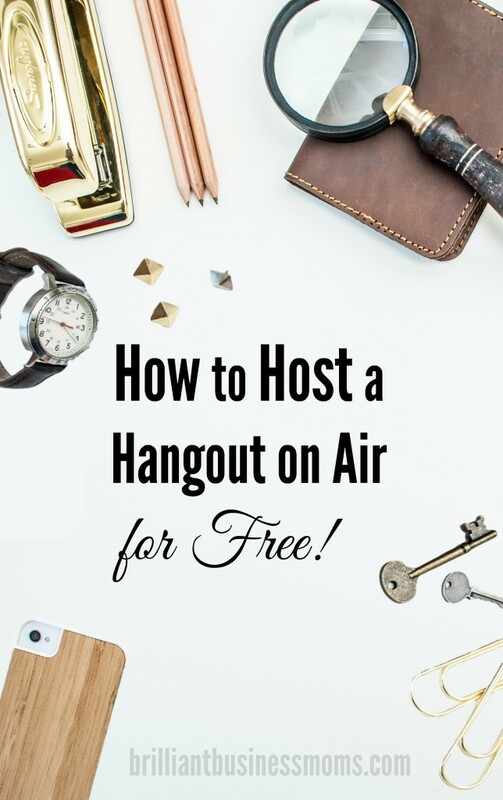 How to Host a Hangout on Air for Free! 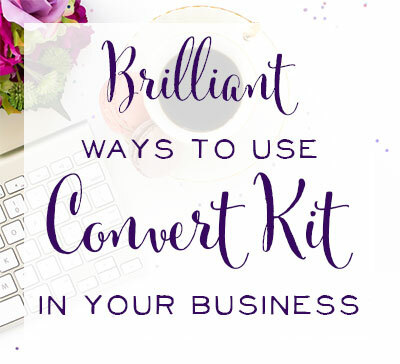 Everywhere I turn, it seems that someone else is hosting a webinar and their business is thriving because of it. Even if you're not ready to get on video and pitch your product, learning how to host a hangout on air is an excellent skill to add to your business arsenal. There's nothing quite like putting your face up on video to truly connect with your audience and let them get to know the real you. There are so many possibilities for what you can do with a Google Hangout. You could teach your audience a new skill such as sewing or knitting. You could have a question and answer session around a topic in your niche. 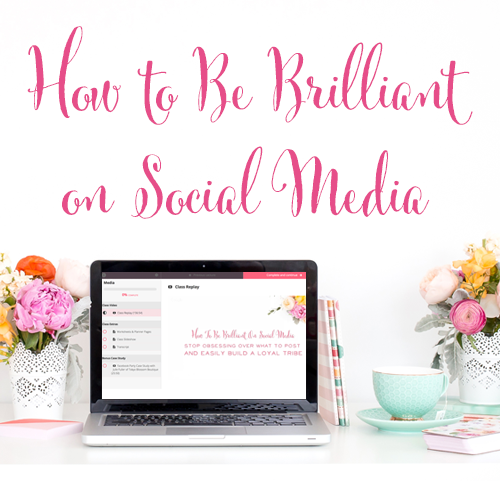 You could bring on a guest expert to teach your audience something valuable. You could make your hangout fun with giveaways and prizes throughout. 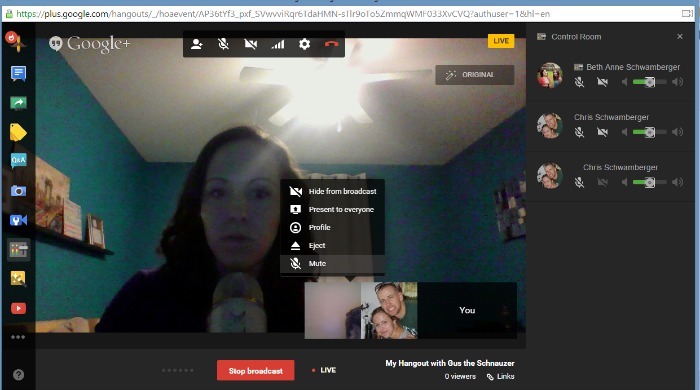 Invite a member of your audience to be on the Hangout with you. Maybe you could flip roles and have them interview you. Show off a new product that perhaps has many different features and benefits to explore. Let's say you're a creative writer – you could host a hangout that serves like a public reading. Perhaps 10 of you sign up to read short excerpts of your work. Is your brain churning with all of the ways Hangouts on Air could take your work to the next level? I hope so! 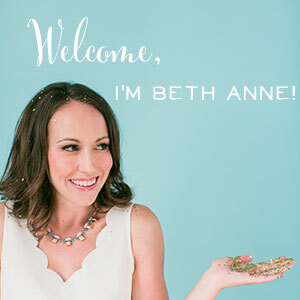 Down the road when our first Brilliant Business Moms product launches, Sarah and I would love to hang out with all of you to tell you more about it, share helpful advice and info, and just connect with you in a more personal way. Who knows? There may even be giveaways and fun surprises involved! In the meantime, hosting a hangout means we get to connect with you all now, hopefully answer some of your pressing questions, and, of course, learn a new skill (hosting hangouts!) that we can teach all of you! As always, before I wrote this post, I scoured the web for advice and information related to Google Hangouts and Webinars. 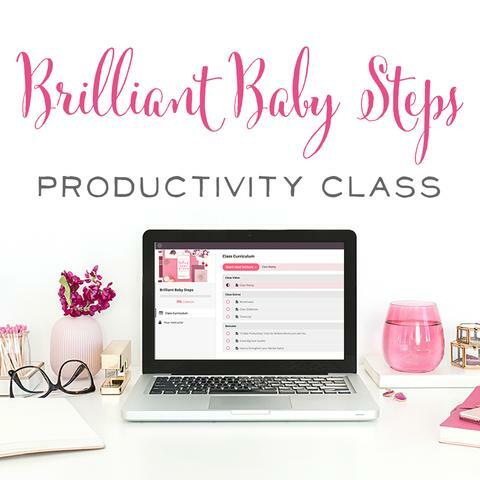 I discovered that there is some insanely pricey software available that's supposed to make your webinar more professional, streamlined, and have more bells and whistles. While this may be true, I also know that the more software I add to the equation, the more opportunities there are for things to go wrong! We're here to tell you that you can host an effective Google Hangout for free or add a few features at a much lower cost than the gurus will tell you. After researching the options, Sarah and I decided that we wanted our audience to be able to chat with each other and with us in real-time during the hangout. For this feature, we're trying out Chatroll. We can embed it in our site, and for $20/month, it allows us to have up to 100 active users on any given webinar. We're excited to try out Chatroll this week, and we can't wait to see what you think! By the way, you can try out Chatroll for free for 14 days, and to enable chat between 10 participants or less, it's free forever. If you don't mind a much slower chat interface that's only available on Google+ then you can absolutely host an effective hangout for free. However, if you know that you want your Google Hangout to take place on your own website, and you know you need some way for participants to interact, then Chatroll is a great option. Once again, though, it's possible to host a Google Hangout on your own site without participants chatting. 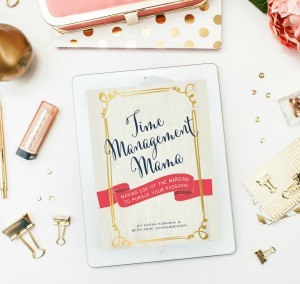 If you're teaching something and just want to roll right on through – no worries – you can embed that hangout for free. So how does this whole Hangouts on Air Thing Work? Great question! 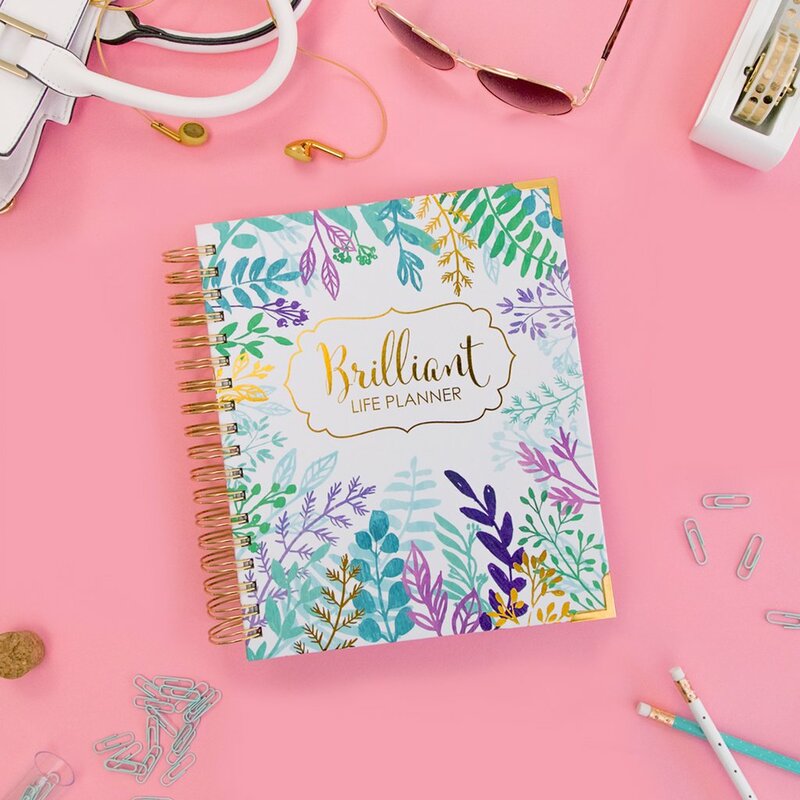 Let me walk you through the process of getting started. 4.) Next, a box will pop up like the one below, and you can choose the date and time to start your Hangout, the name and description of the hangout, and choose your Audience. 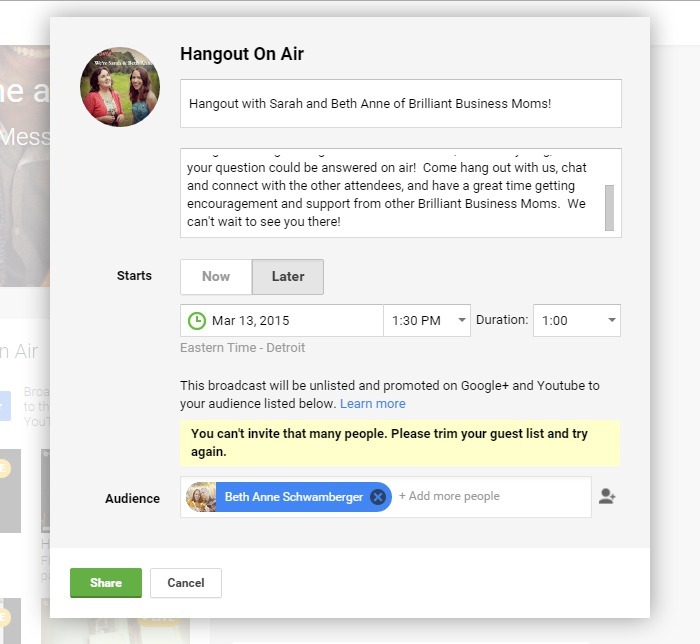 A Note About “Audience” for Google Hangouts: This term is a little deceiving. When I think “audience” I think of who will be watching the hangout. I think about all of you. Initially I had my audience set to “public” and “my circles” and assumed that this way, it would show up in everyone's feed and they'd know about the hangout. When I did this, the error message you see in yellow popped up. It told me I couldn't invite that many people to a Hangout. I started digging around and realized that in this case, “Audience” really means the people that you want to be on video with you for the hangout. So our “audience” is just Sarah and I. So instead, I invited myself to the hangout, and then later added an invitation to Sarah's gmail account. The way I let all of you know about the hangout is by, well………telling you 🙂 We're sending emails out this week, posting on Facebook, and we'll have a special email list for people to sign up who want to be notified about the hangout. By the way, if you want to make sure you don't miss it, just sign up here! Not to mention, I knew I wanted to host the hangout on our own site and not on Google+, so I'd have to share the link with everyone anyways. 5.) Next, a screen like the one below will appear. The blue Start button is the one you'll hit when you're finally ready to broadcast live to the world. 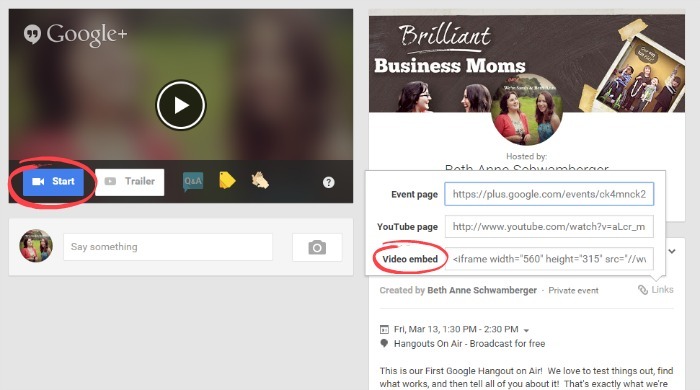 On the right-hand side, you can use the Embed code to embed the hangout on a landing page on your own site. (This is what we'll do for our Hangout.) Just grab that code, create a new page for your site, make sure you're set to “text” instead of “visual” and paste that code right in. Easy-peasy! 6.) If you want to create a distraction-free landing page for your hangout, just select the “Landing Page” option. 7.) The result will look like the image below. Initially, the video box seemed too small, so I went in and changed the dimensions on that bit of code to: width=”700″ height=”394″ Don't be nervous. You literally just switch the numbers to what you want and leave everything else within that embed code exactly the same. 8.) If someone tries to push “play” on the video before the hangout has started, they'll see a countdown timer. But did you know that you can submit an intro video to play here instead? I plan to add one this week, so check back! Again, it's super easy to do, you just go to your hangout page in Google+ and it's right by the “Start” button. Arrive early. Make sure you and any guests who will appear on video arrive early before the event starts to get set-up and test the sound and video quality. Did you know you'll have a green room where you'll be able to see how everything will look and sound before you actually broadcast live to your audience? It's pretty cool! You can even test how a screenshare will work, test out presenting a slideshow, test out talking among different guests, and more. So start that Google Hangout Early, and get into the greenroom well in advance of broadcasting live to your guests. Reboot your computer before starting. This tends to make your system run faster and the process as a whole to run smoother. Use an ethernet cord instead of relying on wireless internet. I actually practiced a Google Hangout with my dog, Gus, and I can attest to the fact that 2 computers doing a Google Hangout and relying on the same wireless internet router is a bad idea! We both were kicked out of the hangout several times due to poor connections. Don't rely on your computer's microphone. Get a high-quality microphone for much better sound quality. Sarah and I list the ones we use on our Resource Page. Use earbuds to eliminate echo and distracting background noise. Ensure the background behind you that will be on video looks clean and nice. Minimal distractions are best, but at a minimum, just make sure your space isn't messy and cluttered. Use good lighting. This one feels tricky to someone who's not a lighting expert. If there's enough sunlight, I recommend opening those blinds and using sunlight behind you. If there's not, you can turn on a regular light, but it won't look so hot. Recently, I learned about Halo Lights from Chalene Johnson, and you can actually get a halo light for around $50, so this is something we may explore if we do more videos in the future. Don't talk over each other. Wait for the other person to give a natural pause before trying to talk. It's confusing and annoying as a viewer when the speakers talk over each other. Use the mute button when necessary. Hangouts on Air automatically shows the video of where the sound is coming from, so if one person has extraneous background sound, that's the person who will show up on screen. Mute yourself when you know you won't be talking for a while or when extraneous background noise happens. Use the “Select Presenter” option to make sure the right person stays on the screen regardless of other noises. 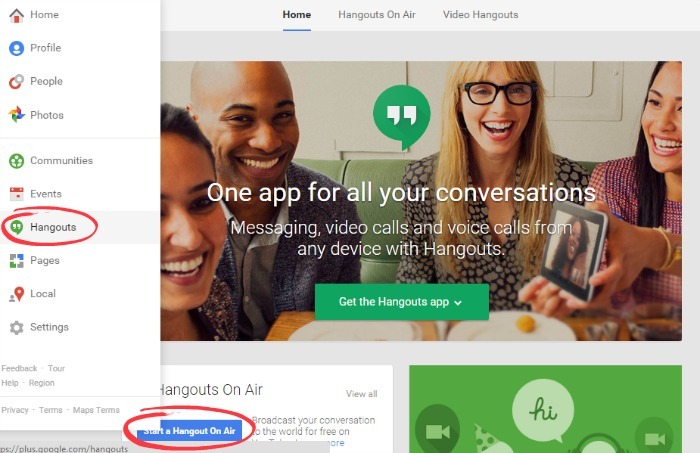 If you have specific questions regarding Hangouts on Air, Google has very detailed information right here. For tips on how to be an excellent Hangout on Air Host or Guest, I found these 3 videos by Lori and Cher of Hacking into Awesome. Seriously, these ladies are talented! I think it's time more people discovered them!